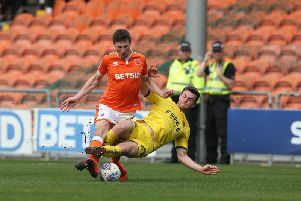 Fleetwood Town head coach Joey Barton’s side strolled to a 4-0 win at Salford City, but as the young guns roared experienced midfielder Toumani Diagouraga’s spell at the club draws to an end. Barton’s first official pre-season clash at ex-Town boss Graham Alexander and skipper Nathan Pond’s National League club went to plan. Goals by development squad striker Ashley Nadesan and young midfielder Harrison Biggins completed the win in front of the BT Sport cameras after experienced forwards Paddy Madden and Conor McAleny had given Town a two-goal cushion. But Diagouraga, 31, was again omitted from the side and Barton says the ex-Leeds midfielder who joined on a free transfer from Plymouth in January, is free to leave. Barton (right) says Diagouraga does no suit the style of football he wants to play when the season commences against AFC Wimbledon at Highbury on August 4. And he says it is not fair to ask the player to sit on the bench as he plans on giving his young midfielders and new loanee Jason Holt from Rangers chances to shine. Barton said: “We did a battery of tests over the first week that we were back, with the style of football we want to play. We told Toums that he can leave the football club and that the way we want to play just does not suit him. “At this stage of his career, I don’t think it is the right thing to do to have him sit on the bench and be a squad player. “He is an experienced pro, who has had a good career, and I think he wants to play first- team football. Whether he can find that or not I’m not sure. “But I want to get young, exciting, emerging talent on the pitch. “Kyle Dempsey is a young lad, Harrison Biggins is a young lad, I thought Nathan Sheron was excellent as a number four in there. We’ve got Sowerby too. “There are a lot of young, talented players and unfortunately for Toums he is not part of that process. “But his career says he has earned the right not to be on the bench or be a squad player. “I think we are working on something, and I think he is working on something. “Look, if he is with us he will be part of the group because that is the nature of the football club that we are running.